A new hire’s first impression of your union significantly influences their decision to join as a member. When done well, union orientation programs are proven to help make a positive first impression on new employees, leading to increased membership and greater union commitment among new hires. 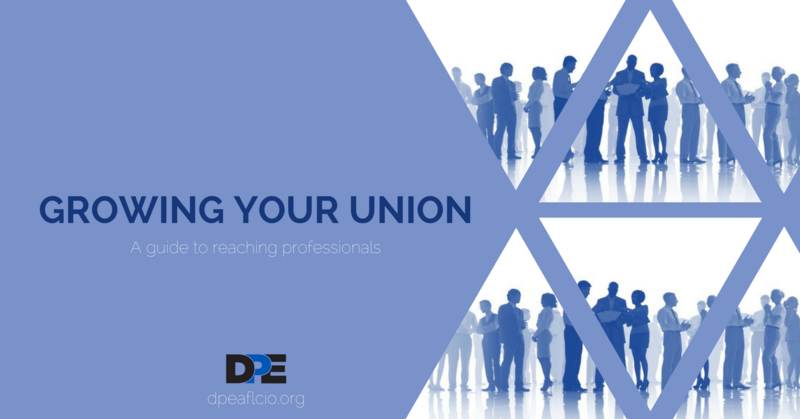 That’s why the Department for Professional Employees, AFL-CIO (DPE) has designed an easy to understand, step-by-step guide for establishing or improving an orientation program that effectively conveys to new hires the benefits of becoming a union member. Growing Your Union: Engaging Professionals Through New Hire Orientation provides practical, ready-to-implement tips for union leaders on how to create a successful, sustainable union orientation program for newly hired professionals or improve on the program your union is currently using. · The results of a DPE-sponsored survey of non-union professionals. · Current successful orientation programs. · Interviews with union leaders and staff responsible for their union’s orientation programs. · Relevant social science research. A preview of Growing Your Union can be viewed here. DPE affiliate unions interested in getting a copy of Growing Your Union or having a DPE staff member give a presentation on the guide should e-mail info@dpeaflcio.org. If you are not an affiliate union of DPE but are interest in becoming one, you can contact DPE President Paul Almeida.